Written by Lujain Al-Saleh who studied abroad on Summer Abroad "Ecological and Social Issues at Lake Atitlan, Guatemala." Lujain is an Environmental Science and Management major minoring in Professional Writing and Middle East & South Asia Studies. She is also a Study Abroad Writing Intern and Blum Center grant recipient. For over ten years, Eliska Rejmánková, a professor of Wetland Ecology at UC Davis and the faculty leader for the Summer Abroad Guatemala, “Ecological and Social Issues” program, has been researching Lake Atitlán, the deepest lake in Central America. Located in the western highlands of Guatemala, Lake Atitlán has been frequently described as one of the most beautiful lakes in the world. Enraptured by the lake and its beauty, Professor Rejmánková decided to return to Lake Atitlán after her first time visiting in 2002. 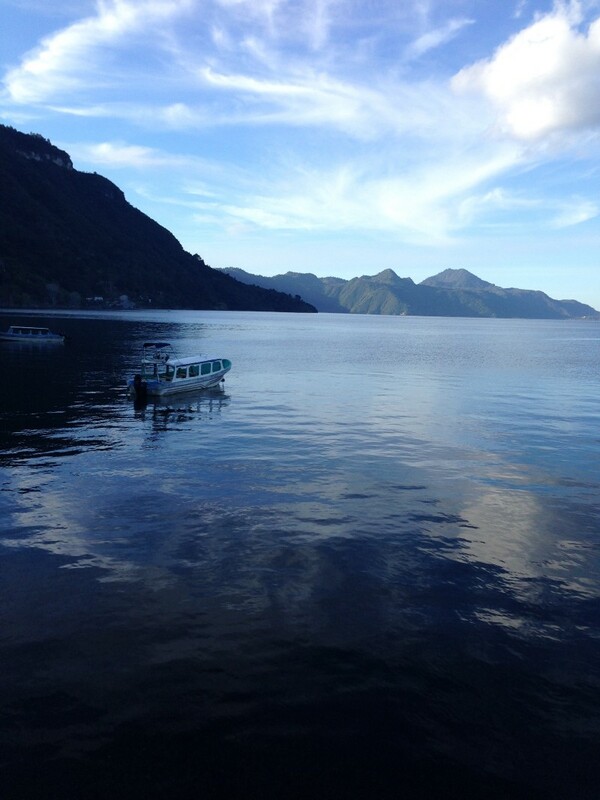 “Once you come here [Lake Atitlán], you always come back,” Professor Rejmánková said. Nearly thirteen years ago, Professor Rejmánková enrolled in a Spanish immersion program in the town of San Pedro la Laguna, one of the eight towns surrounding Lake Atitlán. After the program concluded, Rejmánková returned to visit her teacher and coincidentally noticed that the lake was not as clean as it previously was when she first encountered it during the Spanish program. “I started looking for people who do research and I was surprised to discover that for such a beautiful lake, there was no data,” Rejmánková said. Eventually, Professor Rejmánková met Nancy Girón, a researcher who was already studying the lake. Soon after meeting each other, Professor Rejmánková and Dr. Girón began collaborating with each other in order to gain baseline data on the lake’s profile; they also began training undergraduate researchers and students on how to conduct research on lakes (the study of lakes is known as limnology). At first, initiating the research process was an incredibly slow. Eventually, Rejmánková explained that a growing number of researchers understood that it was time to pick up the pace as Lake Atitlán’s condition worsened. In December 2008, Professor Rejmánková and Dr. Girón met and witnessed the first, small cyanobacterial bloom at the lake. At the time, one of Professor Rejmánková’s colleagues in the Czech Republic was studying cyanobacteria and immediately warned her of its impacts. As cyanobacteria (which are also known as blue-green algae) multiply, they can produce harmful toxins that contaminate the water bodies they inhabit. This contamination has major implications on water that is used for drinking, recreational activities, and agriculture. Along with the potential to produce toxins, the alga that make up these blooms consume high concentrations of dissolved oxygen. This results in hypoxia, a condition whereby dissolved oxygen levels are depleted to the point that various organisms like plants and fish can no longer survive. “We started alerting people and telling people to stop polluting,” Professor Rejmánková said. After this call to action, Professor Rejmánková was able to secure some funding from the National Science Foundation (NSF) to begin researching the lake. The funding was also distributed to Amigos del Lago (Friends of the Lake), a non-governmental organization (NGO) working to conserve and protect the lake. Along with other researchers like Dr. Girón, Professor Rejmánková teamed up with Amigos del Lago to advance research and policy measures at Lake Atitlán. As the research process became more promising due to funding, the issue at the lake was growing in magnitude as well. 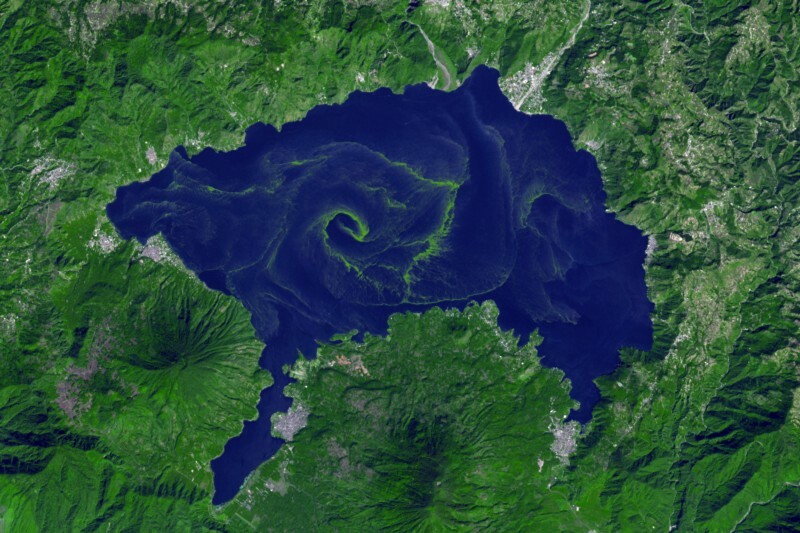 In October 2009, less than a year after the first bloom, a larger, more prominent cyanobacterial bloom emerged in the lake. This was yet another alarm that something had to be done fast. A few months later, in the spring of 2009, Professor Rejmánková met with multiple NGOs like Amigos del Lago to discuss how to conduct research to guide policy measures that would effectively address the complex, multifaceted issues that were growing at the lake. Although meeting with these NGOs was one of the first major steps in the process, Professor Rejmánková explained that at this point in time, nothing much happened. A year later, the “big expedition,” as Professor Rejmánkova describes it, to acquire background data on the lake finally began. About forty researchers and students from universities across the United States and Guatemala were trained to learn how to sample the lake, collect sediment cores, and run bioassays (these are scientific experiments that use live animals or plants to test the toxicity of chemicals). Throughout the month of the program, it was evident that Professor Rejmánková has established connections with individuals from a variety of fields. Rejmánková introduced us to many other researchers, students, cultural anthropologists, journalists, and archeologists in the local region that are also involved in researching Lake Atitlán in collaboration with UC Davis. 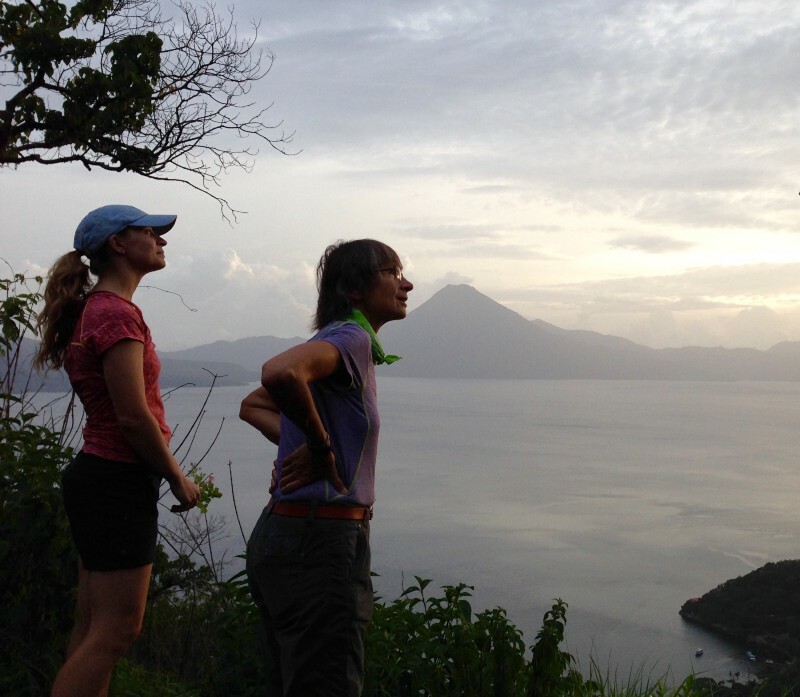 For over 10 years, Professor Rejmánková and Jenise Snyder, a professor at Ursuline College, have been collaborating together to research Lake Atitlán and its overall ecosystem health. As a past PhD student of Professor Rejmánková, Professor Snyder’s research was primarily focused on Belize. While working toward her PhD, Professor Snyder became familiar with Lake Atitlán when she went on a side trip to Guatemala to sample the lake, take a preliminary look at nutrient levels, as well as identify different types of plants in the region. Eventually, the idea of running an international program relating to wetland ecology abroad came about. And it ended up working out serendipitously for both Professor Rejmánková and Professor Snyder. “It fell into place because we work so well together,” Professor Snyder said. Professor Rejmánková has been teaching wetland labs in Davis for approximately 25 years and she explained that over the years, students that were enrolling in the course at UC Davis were not very interested. Since Guatemala has been her primary research location for many years, Professor Rejmánková became interested in somehow offering a wetland ecology lab for students abroad. Similarly, Professor Snyder wanted to run an international course at Ursuline College and expressed this interest to Professor Rejmánková. Although establishing the actual study abroad program took hours upon hours of planning and collaboration, it ended up working out smoothly. This is the second summer that the Ecological and Social Issues at Lake Atitlán program has taken place and both professors expressed their satisfaction with how it has turned out. Although both Professor Rejmánková and Professor Snyder agree that it can be frustrating conducting experiments, it is all the more satisfying when there are breakthroughs. Furthermore, being able to teach students and help them to also achieve these breakthroughs is an important aspect of the program. “Anytime I feel like the students are getting something out of this, it makes me feel really good,” Professor Rejmánková said. Upon moving to the United States from her home country of Czechoslovakia, Professor Rejmánková did not ever want to teach. In fact, she only wanted to conduct research and expressed how terrified she was of the thought of teaching. In 1990, the opportunity to teach at UC Davis eventually opened and so, Professor Rejmánková decided to take a position in the Environmental Science and Policy Department as one of the first female professors. Over the past twenty-five years, Professor Rejmánková has found that she has not only improved her capability to teach, but has also become comfortable as a professor. Professor Rejmánková especially loves this program because she has the chance to share her enthusiasm with students that are learning about Lake Atitlán and the local region. Furthermore, Professor Rejmánková believes that students will be the next generation that work to protect the lake. Unfortunately, Lake Atitlán is not the only lake that is jeopardized by increasingly harmful human activities. Although there have been effective measures set in place to protect Lake Tahoe, there is still a lot of work to be done. According to Professor Rejmánková, the current state of Lake Atitlán is several magnitudes behind Lake Tahoe, illustrating that even more research and legislative measures need to be carried out to improve the lake. With the synergistic interactions between climate change, globalization, and environmental degradation, and inequality, issues concerning lakes, water quality, and accessability will continue to impact both current and future generations. Despite these major challenges, Professor Rejmánková and Professor Snyder believe that students can play a major role in driving both research and policy… and that is precisely what gives them hope for the future.